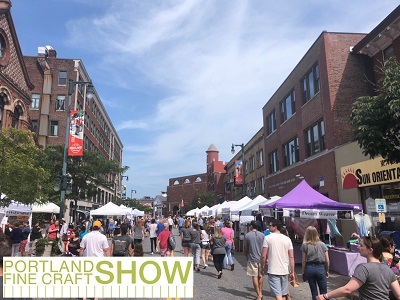 The fifth annual Portland Fine Craft Show, produced by the Maine Crafts Association, will take place on Saturday, August 24, 2019 on Congress Street between State and High Streets in Portland, Maine. 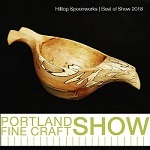 The Show features 100+ juried exhibitors from Maine and the Northeast exhibiting fine craft in the following media categories: baskets, ceramics, fiber, furniture, glass, jewelry, leather, metal, mixed media, paper, stone and wood. PFCS is a one-day, rain-or-shine outdoor event that closes the main thoroughfare of Portland, Maine to vehicles. Exhibitors are prepared for a relatively quick set up (3-4 hours) and take down (2 hours). Established in 1983, the Maine Crafts Association (MCA) supports craft artists by providing educational, marketing and retail opportunities. MCA strives to develop lasting and impactful opportunities for both our members and greater fine craft community. 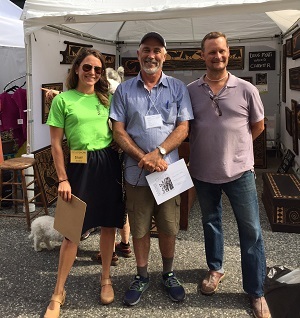 MCA launched the Portland Fine Craft Show (PFCS) in 2015, and it remains one of the only Maine craft shows open to artists not living in Maine. PFCS is a well-organized show with a reputation for high quality and high attendance. Kazeem Lawal - Owner/Curator, Portland Trading Co.
Booths will be in two lines facing one another on Congress St. sidewalks will remain open. Exhibitors receive their booth assignments in early summer. 10 x 10 spaces, EZ-up (or equivalent) tents required. Tent weights required 15lb per corner. Double or triple booths are available. Corner booths are premium - available for an upgrade charge. Specialty Foods, Personal Care, Candles, Books, CDs/DVDs, Cards, 2D Fine Art including Printmaking and Photography, flower arrangements, buy-sell items or any products made from commercially available kits.